Last year I took the plunge and booked a flight and went to BEA. I was nervous, not sure what to expect, and feeling sort of like an impostor in someone else's club. But I went ahead and did it and I haven't regretted that decision for a moment. That trip was worth its weight in gold. If you love books and, more importantly, you love talking about the books you love with other book lovers, and you are dedicated to spreading the word on good books, then Book Expo America is the place for you. Yes, there are tons of ARCs being handed out for free. And, yes, there are scads of wonderful authors signing those ARCs. But, as mind-blowingly lovely as those two things are, they're not the main reason to go. The main reason is those connections you make when you're standing on line and you strike up a conversation with the people next to you and you exchange recommendations and contact information and you know that, even though you're total strangers and you may live in states thousands of miles apart, you're on the same level. You speak the same language. And that language is books. This year there's the added draw of the Book Blogger Convention being held the day after BEA ends (May 28th) right there in the Javits Center. The convention organizers have put together a stellar agenda filled with blogger-led panels on topics ranging from writing and building content to professionalism and ethics in blogging to the relationship between blogger and author. Publishing industry professionals and authors will be attending as well. As for me, I've already registered and am so excited to meet so many of my blog friends there and take part in such a timely and important discussion. This was a huge benefit to me. I went in the day before the crush hit and was able to quietly pick up my badge and admire it without looking like too much of an idiot. I also wandered the floors just a bit to get an idea of where I wanted to be and when. Come April, the BEA website will update with the vast and complicated schedule of which authors will be signing and the number of the line they'll be in. Some will be signing in-booth, some in the bank of lines downstairs. If you do nothing else before arriving, make sure you print out this schedule and highlight the ones you absolutely don't want to miss. Then put together your own list or spreadsheet to help map and plan out your time. In some cases authors will be ticketed and there will be detailed information on where and how to get tickets. You won't be able to get to them all. You might think you're going to attend a panel on YA Buzz Books and then, at the last minute, end up haring off to another floor to meet Neil Gaiman and have him accidentally (but so awesomely) sign your hand. Be prepared to make that call in a split second if needs be. Take a granola bar or a banana, some gum, and a bottle of water or caffeinated beverage (particularly if you got up at the crack of dawn to get one of a limited number of ARCs of the latest Hunger Games book) to last you the day. If you're like me, you won't want to take the time to leave the center to get lunch. There is food available in house but it's fairly expensive and, compared with what wonderful food is available in NYC, not worth it. Save up for the evening and then go out with some friends for some real food. Make sure you make some time to get out and explore the city as well. I highly recommend a stop at the classic children's bookstore Books of Wonder. 5. Relax and enjoy the awesome. Don't be afraid to approach other attendees and introduce yourself or, when appropriate, tell them you love them. Lol. There is still nothing like the feeling I had when the first person came up to me out of nowhere to tell me they loved my blog. Seriously, that's as close to rock star as I'll ever get. And the wonderful thing is I got the chance many times over to do the very same thing. When you meet an author who's been sitting there signing books for an hour or more, have your question or comment ready. Don't take up too much of their time, but be sure to let them know how you feel about their work and how grateful you are to have the opportunity to meet them and read their new book. When you're sitting in line, strike up a conversation with the people next to you. I'm still in touch with those librarians and booksellers I met those three days last year and I absolutely treasure those connections. And that's it for me. So. Any questions? 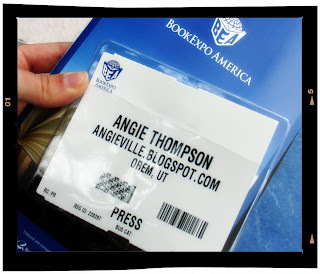 Will you be attending BEA and/or the Blogger Con this year? I can't wait to see you there! I will (probably) be at BEA. Diana, *gasp* we get to finally meet?!?! HA! Juice just came dangerously close to shooting out my nose. Alas, I can't take anymore vacations this year. :( Boo. Angie-girl, I am totally jealous but then me going was never on the cards. I shall live vicariously through you. Good for you for going last year. I totally know that feeling about being at somebody else's party. This event - both of them--sound wonderful!! I'm not going (I think), but wow, how exciting. I'm excited just looking at those pics. I've been at the Javits and I remember that ceiling. It's dizzying! And dizzyingly vast. Oh, I'm glad you did this post! I have always wanted to go, I'm wondering if I can talk my husband into it??? Carolyn, it really is. I loved just wandering and wandering through all the booths and sections. Kath, ooh. Start talkin'! You would loooove it. I want to go so bad! Alas, the budget doesn't allow for trip to New York. I will also have to live vicariously through you. Hope you have fun! Caitlin, I hear ya. I hoard Skymiles like a miser for just such occasions. Knowing my luck, Richard will be there. If he is, take picture of him for me. Lauren, you will quickly feel at ease, I'm sure. So glad you'll be there! And thanks for the link. I'm really looking forward to WHITE CAT. Angie! So happy you're going again. Let me know if you need a place to stay. We have extra room. Also, I'd love to meet up if you have time! I work in Manhattan so I can meet you. Yay Yay Yay! Michelle, you talk to that hubby. And I was a complete zombie. But it was worth it! Kos, yay! I've been thinking about you since I registered. We are definitely going to have to meet up! Will email you when my plans are firmer. Raspberry, I know. I'm only able to do it because my husband is an angel who works freelance. Christine, sounds like a plan to me. I can't wait! I am in and I am so excited! You brought up some great points here that I can add to my every growing list of tips! Sheila, yay! It's such an exciting prospect. Looking forward to seeing you there. I'm excited! Going my first time :) Thanks for the tips and maybe we'll bump into each other.